If you are the ECB and you are not legally permitted to purchase outright material amounts of eurozone bonds (at least not now), what options do you have left to stabilize the eurozone? One option that has been kicked around is you would lend to the IMF, who in turn would buy the bonds. But that's tricky to implement and would run into all sorts of opposition. An alternative is to have the eurozone banks load up on more sovereign debt, but the trick is to incentivize them to do so. What ultimately brought down MF Global when they held sovereign bonds was a funding squeeze. They held these bonds via a short-term repo and the counterparties refused to roll the repo loans. 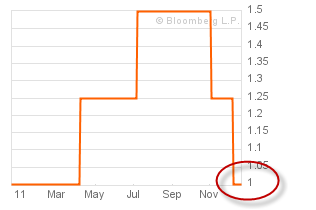 Keenly aware of this issue, the ECB is making banks an offer the can't refuse - term funding via 3-year loans at 1%. Now the banks don't have to worry about financing by purchasing bonds with maturities under 3 years and locking in the spread. Of course the worry is still default risk. But it is fairly certain that Spain for example is not going to default in the next six months. At 3-4% the Spanish 6-month bills now look attractive as the banks would be locking in 200 - 300bp with no capital usage (the 1-3-5 rule: borrow at 1% lend at 3% and be on the golf course by 5.) In fact the bills could be used to satisfy the banks' liquidity ratio requirements as well. So the only risk remains is a significant downgrade of Spain within the next six months, making Spanish debt ineligible as collateral at the ECB. The AA- can and probably will drop at least a notch. But no worries - should Spanish debt get downgraded to junk, the ECB will simply waive the rating requirement as it did with Portugal. 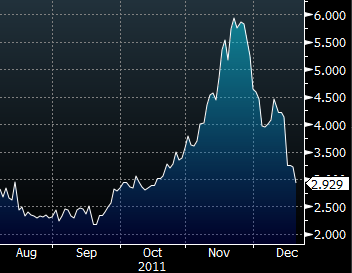 In response, the Spanish six-month bill yield is down 300bp from the peak. 1. It gets banks to buy material amounts of eurozone sovereign debt where the ECB is unable to do so. 2. It also slowly recapitalizes the eurozone banks by giving them an opportunity to make significant amounts of money over time without much capital usage.